February 13th, 2019 - Does My Bomb Look Big In This? After starting out as a staff member at the original Kelby’s Café, Moe Issa not only moved into an ownership role, he also expanded the business. 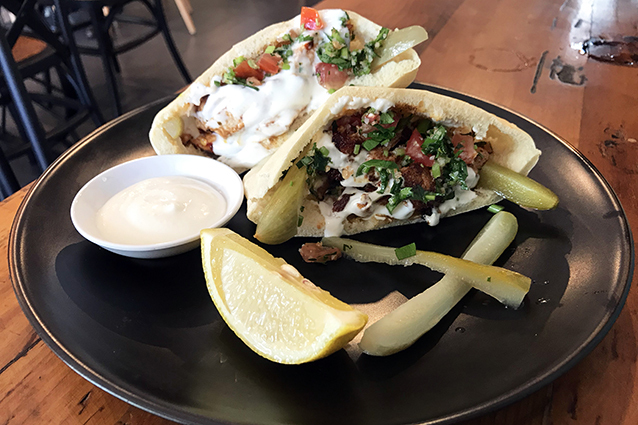 The recent move into competitive Surry Hills comes after Issa put his own stamp onto the popular Marrickville original by redecorating it and bringing flavours from his own childhood onto the menu. The new café is situated right at the bustling bus stop on the corner of Elizabeth and Devonshire Streets. 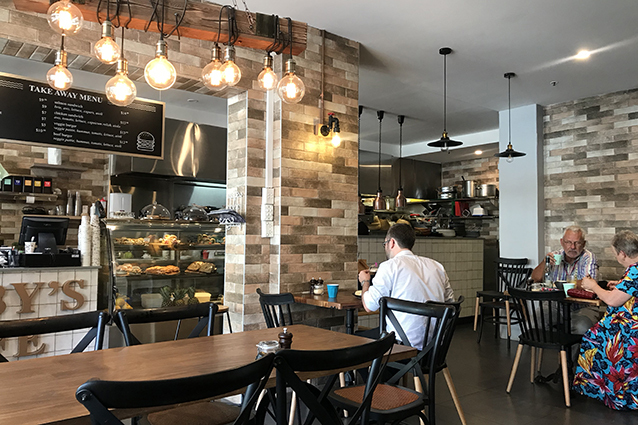 While from the outside it looks like a takeaway shop, once you’re seated, you’ll find Issa has worked hard to drag your eyes away from all the traffic. Faux brick walls, a cheeky mural of the owner, and a gaggle of exposed Edison hanging over a large central table help to give this space the same cosy feel as his other café. The extensive all-day breakfast and lunch menu has all your regular café favourites, along with a good number of Lebanese and Egyptian inspired items. 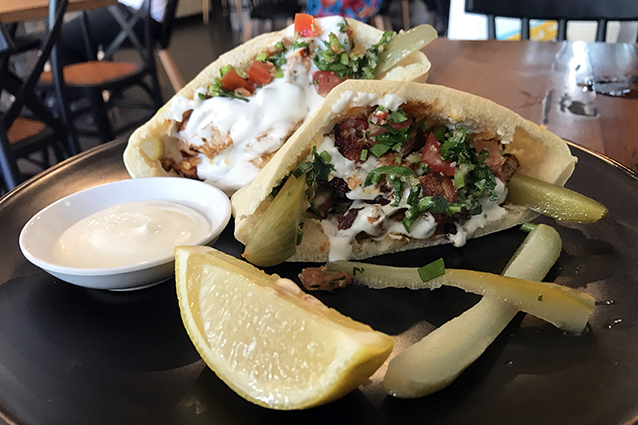 The Chicken Shawarma Pocket ($12) takes pickles, tabouli and marinated chook, and stuffs it into a pita bread pocket for ease of eating, with extra lemon and yoghurt sauce on the side. Getting them to add some chilli wasn’t a hassle either. 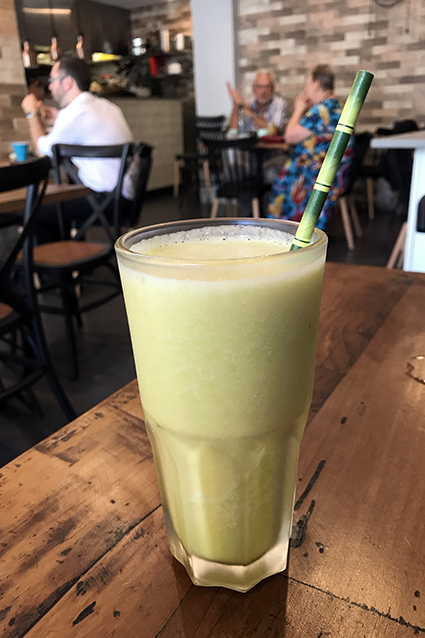 Being a hot day, I ate mine with a Make-Your-Own Juice ($5.90) combination of pineapple, mint, ginger and lemon, that was sharp and enjoyable (and freshly squeezed to order). 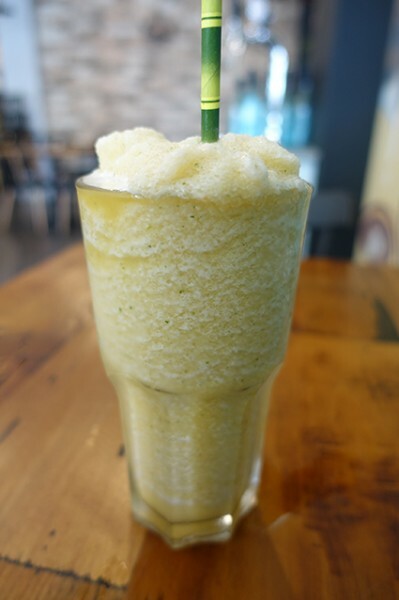 With the weather still warm, on my next visit I opted for the Mojo Mint Frappe ($6.90) made by blending apple juice, pineapple juice, mint and ice. It arrived with an embarrassed counter-hand and a tell-tale orange hue that suggested the juicer hadn’t been cleaned properly after the last drink. While they did offer to make me a new one, I drank the slightly off-kilter combination because I don’t like wasting food or drink. 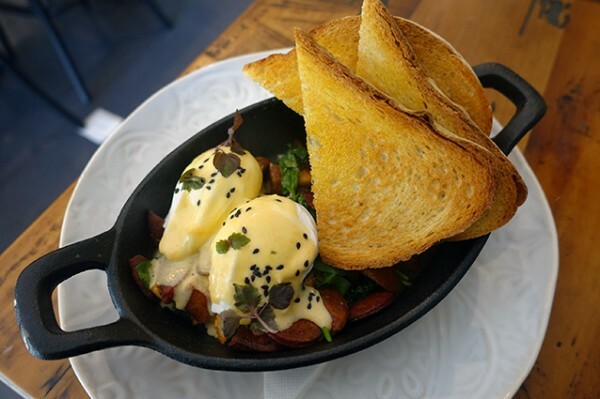 I teamed it with the Kelby’s Hash ($19.90) a breakfast selection that’s flavoursome enough to also work as lunch. Presented in a cast iron pan, it’s a well-handled mix of baked, skin-on potatoes and tasty hunks of sucuk (Turkish beef sausage) gentled with golden fingers of pan-fried haloumi, baby spinach and caramelised leeks. 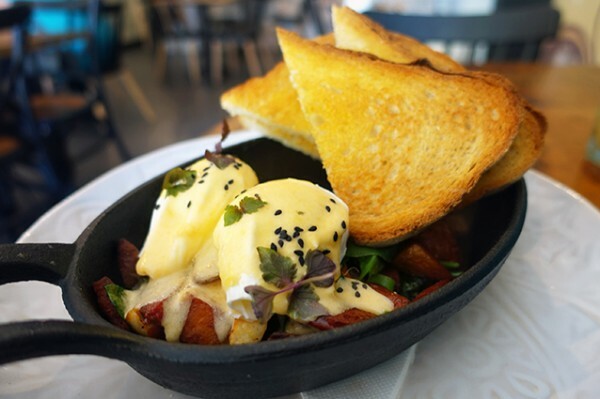 The oil-free mix is topped off with two perfectly poached free-range eggs, dribbled judiciously with a light Hollandaise. While at just shy of twenty bucks it isn't a cheap lunch, with the generous amount of buttered sourdough they present with it, you're not going to walk away hungry from it. 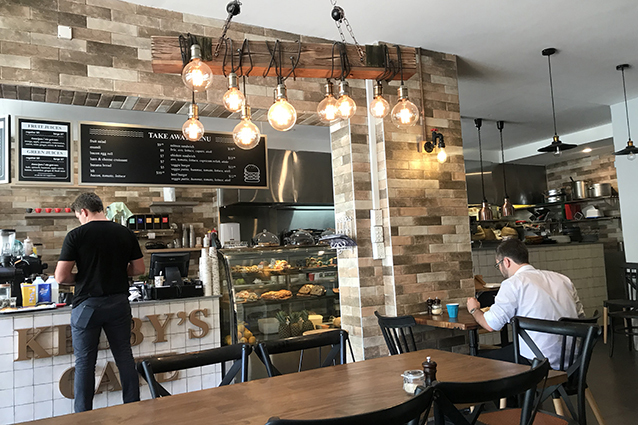 With both visits producing something tasty, I reckon I'll return to explore the rest of the Kelby's Cafe menu - it's a good addition to this part of Surry Hills.